In 1999, Illustra Media began a project that would span nearly a decade, four continents, and thousands of hours of research, writing, editing, computer animation, and photography. The result was a documentary trilogy that would inspire and educate millions of viewers throughout the world--and fuel an international debate over the validity of Darwin’s theory for the evolution of life on Earth. In 1859, Charles Darwin published, On the Origin of Species. In it, he argued that all life was the product of undirected natural processes--time, chance, and natural selection. Since Darwin, biologists have relied on such processes to account for the origin of living things. Yet today, this approach is being challenged as never before. 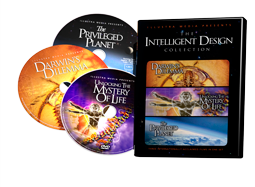 Unlocking the Mystery of Life is the story of scientists and scholars who are advancing a powerful idea: the theory of intelligent design. Using state-of-the-art computer animation, this landmark film transports you into the interior of the living cell to explore systems and machines that bear the unmistakable hallmarks of design. Today, most scientists and philosophers claim that Earth is an ordinary speck of dust adrift, without purpose or significance, in a vast cosmic sea. This idea is an outgrowth of the naturalistic philosophy that has dominated science for the past 150 years. Yet, remarkable evidence--unveiled by contemporary astronomy and physics-may now tell a very different story. We know that a rare and finely tuned array of factors makes Earth suitable for complex life. We depend on our planet's oxygen-rich atmosphere, its large moon, its planetary neighbors, and its precise location within the solar system and Milky Way galaxy. But the story does not end here. For, the same factors that make a planet like Earth hospitable to life also provide the best conditions for scientific discovery. Is this correlation merely a coincidence? Or does it point to a deeper truth about the purpose of the cosmos and the reality of a transcendent designer? The answer could dramatically effect the direction of 21st century science. This groundbreaking film examines what many consider to be the most powerful refutation of Darwinian evolution: the Cambrian fossil record. Charles Darwin realized that the fossil evidence did not support his theory of gradual, step-by-step evolutionary development. He hoped that future generations of scientists would make the discoveries necessary to validate his ideas. Today, after more than 150 years of exploration, fossil evidence of slow, incremental biological change has yet to be excavated. Instead, we find a picture of the rapid appearance of fully developed, complex organisms during the outset of the Cambrian geological era. Organisms that embody the major animal body plans that exist today. This remarkable explosion of life is truly Darwin's dilemma and may be best explained by the existence of a transcendent intelligence.